The easiest job offers navigation jobboard. 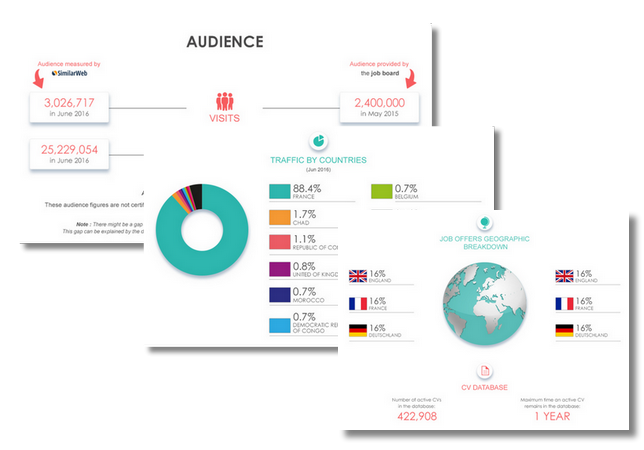 Summary: Founded in 2008 by Carlos Goncalves et Fabrice Robert (who also founded Keljob), JobinTree works with L’Express Emploi and Vivastreet to cater to your advertising needs (with a job hierarchy spread out among them). 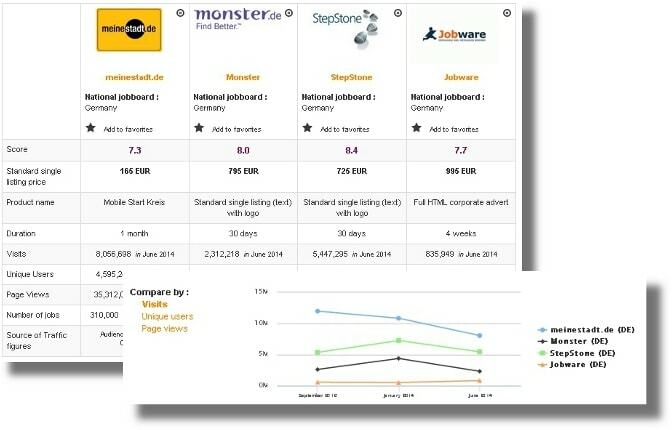 Depsite the many articles claiming the job board gets 1M + visits per month, SimilarWeb tells a different story: 433 500 visits per month on average in France (and about 70 000 in Africa) and number 1 079 on the list of most popular job related websites. Keljob and Jemepropose (created in 2013) are both more popular. JobInTree currently boasts 157 314 jobs. Design: In a way, the job board has a relatively administrational feel to it because of the small font and the page setup (and the emphasis on courses). The job page is green (no surprise when the logo is a tree and a person) and the course page is blue (they are clearly separate). There are also two different section for jobseekers and recruiters. You can search jobs by industry/keywords or location (or the salary, experience and contract). When listed, the jobs indicate the job title publication date, the company, the location, the type of contract and summary of mission. Jobs appear in order of pertinence or date. 70 pages in, it STILL said the posts were from today. With keywords, the openings have different dates, but they cannot show up in chronological order. If you click on a job offer, you get who published it, when and where, followed by the contract and required experience. The length of the offer varies. The job board objective: If you want to sign up to JobInTree, you need to have a clear job title. For recruiters and jobseekers alike, this means knowing what you are looking for before looking. Recruiter observations: To create an advert, you are redirected to La-Regie-Emploi.com (created in 2014 by JobInTree) to advertise. You can advertise three job offers for 30 days free of charge (after that, you need to contact them for pricing information) but you need a French identification number (SIRET) to create an account. The job offer is in three parts: job description, company and candidate. The job offers: You can look up the companies recruiting on the website in their “company” listing. However, the numbers are all off (they say “1178 jobs” when really there are 2). Apparently, they specialise in jobs for undergraduates. Reactivity: Automatic e-mails keep you updated. Special features: mobile app; job alerts; job files (with a definition, requirements and salary information for each job and the available job offers/ courses); Dictionary; press section (last updated in 2016); the blog (in French, with categories); company listing (with completely inaccurate job offer information). Verdict: JobInTree is very interesting if you want to brush up on work/company related jargon (they are big on definitions), and to find company names based on their sector. There is no harm is using it for free ad space, but I might consider other – more truthful – portals for a big ad campaign. Login here for FREE to unlock access to the traffic audience, content and pricing section for more information on Jobintree. je croyais que c'était un site pour les jobs dans les espaces verts ..; mais pas du tout Quelqu'un peut m'expliquer pourquoi ce site s'appelle comme ça ?